Boise State defensive coordinator Andy Avalos talks to the media on Monday, Oct. 22, 2018. We had been lulled to sleep by the theoretical finalizing of Boise State’s 2019 football coaching staff. But the team in green about 450 miles to the west was ready to pounce. BOISE, Idaho — Wednesday, February 27, 2019. Maybe it’s just me, but when Jim Leavitt left the defensive coordinator’s post at Oregon two weeks ago, I didn’t seriously consider that Andy Avalos was the Ducks’ target. 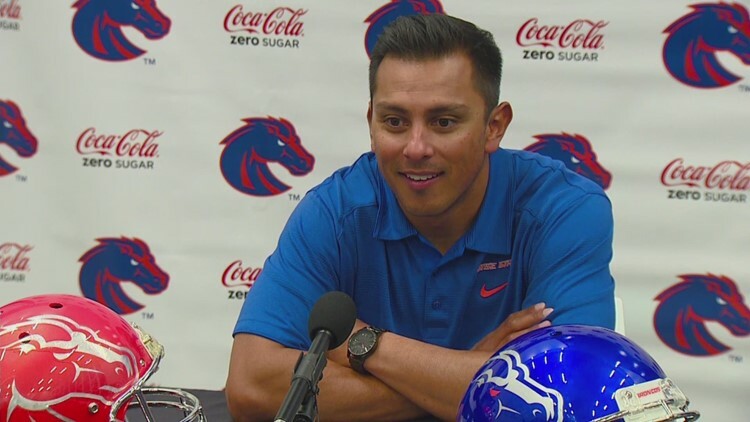 But Avalos is the guy, and he leaves Boise State after seven years on the Broncos’ staff. With spring football starting Friday, coach Bryan Harsin is in an awkward situation. There’s nothing Avalos could have done, though. For several years, he has resisted overtures from near and far. Now comes a job that promises to be a great fit for him, potentially tripling his salary at a place he can win. Oregon coach Mario Cristobal saw Avalos’ defense stifle his offense in the 2017 Las Vegas Bowl. Who knew that would be an audition of sorts? Avalos bleeds blue, no doubt about it. He was at the core of the defenses that launched Boise State into the top 25 in the early part of the century. Which instantly evokes memories of Avalos rumbling 92 yards with a pick-six against Louisville in the 2004 Liberty Bowl, (accompanied by a Bronco convoy). After that game, he began his coaching journey, from high school to grad assistant status at Colorado to Division II to FCS and back to Boise. This could be seen as similar to when Harsin left Boise State after the 2010 season to become offensive coordinator at Texas. He was priming his future—and his future ended up being in the head coach’s office at his alma mater. There’s nothing to say the same thing couldn’t happen with Avalos someday. Forner Boise State running back Alexander Mattison gets down to brass tacks today at the NFL Combine in Indianpolis, going through his “underwear tests” as well as a good chunk of his NFL team interviews. This will be the first time most NFL front office people have had a chance to talk to Mattison one-on-one, and they’re sure to be impressed. Mattison is an articulate guy and a great student, and he’ll surely be able to demonstrate the ability to absorb a playbook and be a good teammate. Funny—those are the qualities Brett Rypien will being to the table in Indy, too. The Andy Avalos news has overshadowed what is a very important contest inside Taco Bell Arena tonight. Boise State tries to snap its three-game losing streak when Colorado State visits. The 70-68 win over the Rams last month in Fort Collins was the Broncos’ only victory in a one-possession game this season. CSU has been Jekyll and Hyde this year. Take Air Force and Fresno State, for example. The Rams have beaten the Falcons by 23 and 32 points and have a nine-point win over the Bulldogs. Boise State is 0-3 against those foes. Colorado State is tied with the Broncos for seventh in the Mountain West right now and aims to bump the Broncos down to eighth, a spot that would prove dicey if it held into the Mountain West Tournament. Boise State would be wise to leave the brooms in the locker room tonight. Last Saturday, after dominating Colorado State in Laramie, Wyoming players walked into the Rams’ Moby Arena carrying a broom. Of course, there would be no sweep, especially after that. Final: Rams 83, Cowboys 48. “We seen them walk in with a broom and we wanted to set the tone early,” CSU senior J.D. Paige said in the Coloradoan. “We definitely took it personal when we saw the broom.” The Rams’ 35-point margin of victory was the largest in the 230-game history of their rivalry with Wyoming. The Boise State women will have to make the NCAA Tournament the same way they have in three of the past four years—win the Mountain West Tournament. That has always been the reality, but now it’s magnified after the Broncos were upset last Saturday at Utah State. Their NCAA RPI ranking has dropped from No. 52 to No. 58, and there’s no amount of winning they can do the next three weeks, including tonight’s game at Colorado State, that can make them candidates for an at-large berth. Next question: will Riley Lupfer play tonight? HOW’S THE WEATHER IN SOUTH DAKOTA? It’s supposed to be below zero through most of the weekend in Sioux Falls, SD. And it’s not going to moderate much by the time the College of Idaho men arrive early next week for the NAIA Division II Championships. But do you think the Coyotes care? They’re back at nationals after beating Southern Oregon 70-55 Tuesday night in front of a raucous crowd in Caldwell. After trailing by as many as six points midway through the first half, C of I took the lead for good with about five minutes left before the break. The Yotes were dialed in, committing only eight turnovers, and they slowly but surely pulled away in the second half to punch their fifth ticket to the national tournament in the past six years. An outstanding capper to Colby Blaine’s first season as head coach. It was just January 17 that Idaho wide receiver Collin Sather started experiencing stomach pains. Four days later Sather was checked out at the hospital and was diagnosed with advanced renal cancer. He died Tuesday morning, two days after his 19th birthday. Sather, a redshirt freshman, was a 2018 graduate of West Valley High in Spokane. A tough, tough deal for his family, his Vandals teammates and coaches, and his UI campus friends. Bob Cousy of the Boston Celtics destroys the previous NBA record of 21 assists in a game as he dishes out 28 in a 173-139 shellacking of the Minneapolis Lakers. The Celtics also set a mark for most points in a regulation regular season game, as Cousy scored 31 points and Tommy Heinsohn poured in 43. Their performance is all the more amazing in light of the fact the Celtics played without star center Bill Russell that night. Cousy’s standard would stand for 19 years. The current record for most assists in a game is 30, set by Scott Skiles of the Orlando Magic in 1990.